A long time ago, when Caity was a wee girl of seven, she wrote her mom a note. Sounds like everyday in my house. Actual Translation: Mom, you scratched me when you spanked me. I know you hate me, you can tell me that. Anyway, can I call Dad? I have a feeling you’ll say No. Now what am I gonna do? Your stupid daughter, Caity. P.S. Enjoy the rest of the show. P.P.S. I didn’t mean to do that. Because no one knew where it was gonna land!! P.P.P.S. I feel sick. 😦 XOXOXO…. Metaphorical Translation: Mom, we’re little sh*ts. I won’t be surprised if you open a bottle of wine. I will be surprised if you wait until after dinner. Thanks to Caity for the submission. You can find Caity at her blog, Readviews. please consider submitting it as a jpg file to mcfadden.chase@gmail.com or leanneshirtliffe@gmail.com. Posted on April 18, 2013, in For Moms, Notes. Bookmark the permalink. 4 Comments. 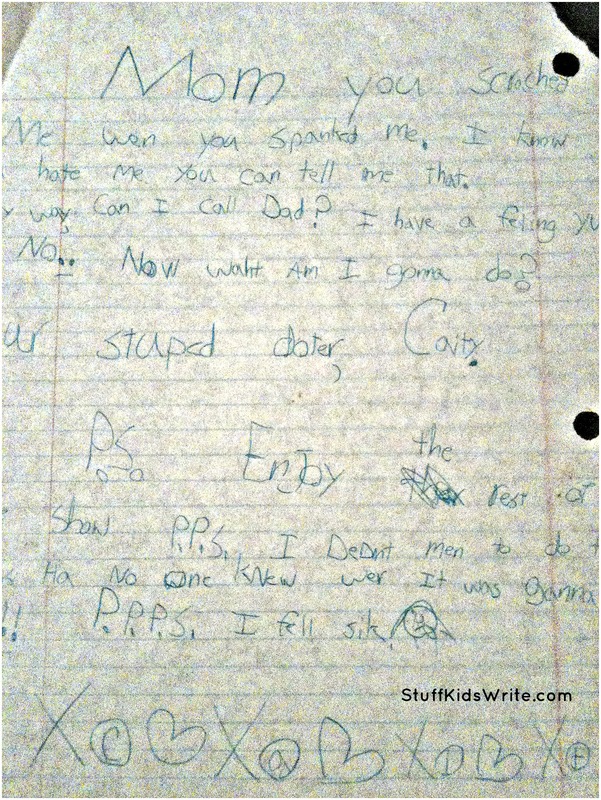 Superb blog, actually laughed out loud reading it, oh to be a parent huh?! Hahaha. It shows we all know how to guilt trip from day one. Goodness me.